Outside: it has a great area for sitting outside on the Radetzkyplatz, in the so-called “Shani-Garten” (the Austrian word for outdoor dining area), but only in summer time! I really like the atmosphere of a nearly village-like feeling of this square, despite the nearby train tracks. Inside: You can also enjoy the interior of this traditional Austrian tavern, with simple but cozy furnishing. 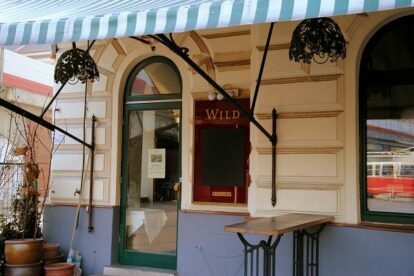 “Wild” provides very good Austrian cuisine mixed with some modern culinary ideas. The prices are a bit high, but the atmosphere – indoor and outdoor – is quite special. The food is very tasty and there is a selection of very good wines!